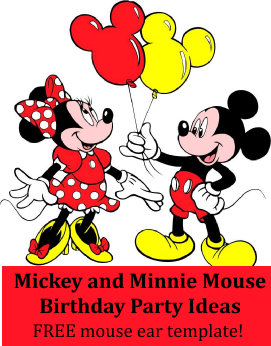 Mickey Mouse & Minnie Mouse make a great birthday party theme for kids of all ages. Also a great birthday party theme choice for siblings and twins. Use this easy Mickey Mouse ear template for invitations, decorations or party favors. Stamp blank white cards with mouse ears across the top or all over the front of the card. Write birthday party details inside. Solid red cards with a mouse ears punched out of the front of the card (buy a mouse ear hole punch at most craft stores). Include the punched out ears inside the card as confetti. Solid Red cards with white polka dots. Decorate the Mickey and Minnie Mouse party in Red, White and Black with a little yellow thrown in. Use Red tablecloths and solid white plates (Minnie Mouse's polka dot dress), black cups and yellow utensils. Use helium balloons tied in bunches for party tables or tie on the backs of chairs. Black, red and yellow streamers are always a fun touch. Mickey is going to try and tag Minnie Mouse. Have them pass the balls faster and faster. When Mickey catches Minnie play another round - this time go counter clockwise! Print out mouse ears using the mouse ear template (see link above) - you can cut them out or leave them one to a sheet of paper. You need lots of small Mickey & Minnie themed prizes for this game. Assign each prize a number. On the bottom of the Mickey & Minnie ears write a number which matches the numbers on the prizes. Lay the Mickey & Minnie Mouse ears on the floor and play some fast music for the kids to dance to - tell them when the music stops they must find a mouse ear and stand on it. Start and stop the music and let the kids dance, stop, find a mouse ear to stand on and then start dancing again several times. At the last round when they are standing on their mouse ears tell them to pick up the ears and they will receive the prize which is the same number as they have on their sheet of paper. Our party games page and Mickey Mouse party ideas page have more fun games to play! Make cupcakes with red frosting and place white circles of frosting on some for Minnie's dress. Scoop up two scoops of chocolate ice cream (Mouse ears!) for each guest and then let them add sprinkles, nuts, chocolate syrup, gummy bears, crushed up candies, etc. to make it their own. Marshmallow Sprinkles - Skewer large marshmallows with wooden skewers then dip in a little bit of water. Roll in red sugar sprinkles so that they stick to the marshmallows. Place the bottoms of the skewers in a tall glass jar (like a canning jar) so that the marshmallows are standing outside of the jar. Tie a black and red polka dotted ribbon to the jar and set out on the food table. Use the Mickey mouse ears template and cut out black ears. Place party favors in a red bag and fold down the top. Glue or tape the ears on the flap.